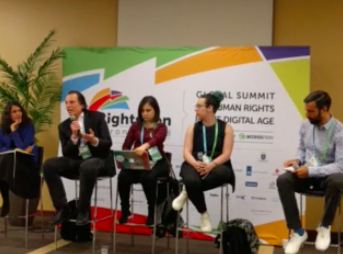 Last month, dozens of members of the Berkman Klein Center community participated in RightsCon 2018 in Toronto, a global summit focused on human rights in the digital age. At the conference, BKC staff, fellows and affiliates joined sessions and shared work on a variety of topics including media manipulation, Internet censorship, online hate speech, the ethics and governance of AI, digital inclusion, children’s online privacy, and more. In this session, BKC director Chris Bavitz spoke about his experience helping researchers navigate red tape and mitigate the legal risks of their work with private companies, explaining that potential corporate collaborators have two primary concerns when sharing data with researchers: liability and reputation. Research into online hate and harassment is in its early stages and can benefit from corporate involvement, he said. To help focus future work in this area, BKC research director Rob Faris offered three questions: “What are the things we want to learn about the world? What are the research frames and frameworks? And what are the constraints in further work?” One example of a current framework is BKC affiliate Camille Francois’s perpetrator-centric research, which uses counter-messaging against extremism by targeting ads at specific keywords. BKC faculty associate Susan Benesch argued that the ideal solution to the problem of online hate and harassment is favorable behavioral change. Therefore, she said, researchers first must better understand several aspects of the phenomenon that are still unclear: “Who is posting what content, and why, and who is susceptible to which kinds of interventions?” Only after understanding and addressing these issues can researchers and policymakers craft interventions that will lead to desired behavioral changes. Why do media ecosystems perpetuate the spread of disinformation and manipulation? BKC research director Robert Faris suggested that research into this issue must understand human beings, and not just bots, as central to media networks. One person doing this work is BKC fellow An Xiao Mina, who is creating tools for collaborative verification and trying to add more nuance to conversations about disinformation. For example, Mina said she wants to move away from the binary of whether a piece of news is merely “fake or not,” and study the complexity that exists in this phenomenon. Through her projects, Mina said she is bringing together people from diverse backgrounds to define web-wide indicators of content credibility. In conclusion, the panelists reiterated that robust funding and convenings such as RightsCon are crucial and add value to the work that many organizations are doing with regard to media manipulation. In this panel BKC senior researcher David O’Brien asked, “How can we hold companies accountable and keep their policies transparent?” and “How can we empower individuals?” The Transparency Reporting Toolkit developed by the Berkman Klein Center and New America’s Open Technology Institute aims to address these questions by identifying a standard set of practices for companies’ transparency reports. Increasingly, panelists said, consumers are concerned with both how companies themselves use their information and, if and under what circumstances their information will be released to the government. In order to foster greater accountability within the technological and media industries, they noted, civil society and government regulation will need to continue to balance one another. In this session, Digital Rights Foundation, Pakistan executive director and BKC affiliate Nighat Dad explained that since 2008, there has been about one government shutdown of Internet services per year in Pakistan, which have led to social problems and human rights concerns. However, she said, governments have not responded to advocacy work that focuses on human rights violations regarding Internet shutdowns. In response, moderator and BKC affiliate Arzu Geybullayeva asked, “What is the roadmap for a way forward?” According to the panelists, activists are now seeking alternate methods of persuasion such as the Cost of Shutdown Tool (COST), a new policy tool for Internet freedom announced at the African Union Commission meeting in Addis Ababa by the Internet Society and NetBlocks.org, which aims to show governments the economic effects that internet shutdowns, social media restrictions, and mobile data blackouts have on their countries. The implications are clear, according to panelists: countries stand to lose major revenue as a result of these types of censorship. They advocated for continued work on empowering civil society and using strategic litigation will complement this new tool. A complete list of BKC-affiliated sessions is available on the Berkman Klein website.